The Establishing Shot: 2 GREAT DELETED SCENES ON THE AVENGERS ASSEMBLE BLU-RAY SPECIAL FEATURES, MARVEL ONE-SHOT: ITEM 47 & ARE THE MARVEL ONE-SHOTS PREPARING US FOR THE S.H.I.E.L.D TV SHOW? 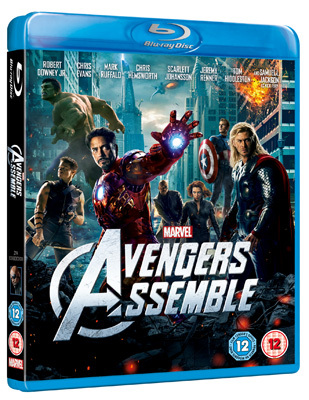 2 GREAT DELETED SCENES ON THE AVENGERS ASSEMBLE BLU-RAY SPECIAL FEATURES, MARVEL ONE-SHOT: ITEM 47 & ARE THE MARVEL ONE-SHOTS PREPARING US FOR THE S.H.I.E.L.D TV SHOW? Avengers Assemble really took me by surprise I genuinely did not expect it to be as great as is. How could it be? How could taking some of Marvel’s greatest characters, each a huge complex franchise in its own right and put them on screen together possibly work? It does and then some – the long story short is that Joss Whedon makes movie magic and brings back the magic of the Saturday matinees of my youth in a solidly entertaining super hero film. So a couple of weeks ago I was fortunate enough to be invited to Disney to see a special presentation of the features to be found on the Avengers Assemble Blu Ray released next week. A bit geeky - you may think. But many of these missing & alternative scenes, bloopers and featurettes had not been publicly seen yet - so I was pretty excited also this was the unveiling of the next in the series of Marvel’s one-shot short film Item 47 to the UK. 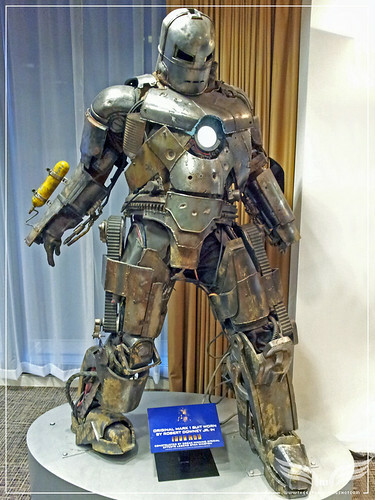 The Establishing Shot: ORIGINAL MARK 1 IRON MAN SUIT WORN BY TONY STARK (ROBERT DOWNEY JR.) IN IRON MAN - WALT DISNEY, LONDON, a photo by Craig Grobler on Flickr. Just so that you know this started out as a post about my chat with Titus Welliver one of the stars of the Marvel One-Shot: Item 47, in our brief chat we touch on the Avengers Universe amongst other bits but in putting my thoughts to virtual paper it became apparent that some preamble may be needed hence the following. Watching the featurettes and alternative scenes brought that magic right back to me again in all honesty I was expecting Item 47 to be the highlight of the event and it was actually the reason I went along but watching the special features I couldn’t help but marvel at the entertaining personalities and hard work behind Avengers Assemble. I enjoyed this darker take on the opening of the Avengers Assemble and it may well have set up a nice bait and switch regarding the fate of Nick Fury ( Samuel L. Jackson ) before changing direction, it also gives us insight into Agent Maria Hill ( Cobie Smulders ) and her strength of character. Stylistically it fits in with the other pre & post credit sequences albeit substantially longer. I’m unsure if it would have worked as well rolling out the remainder of the tale as it gives away as much as it hints at - hopefully somewhere in the features we will find out why the different opening scene was chosen. My favourite clip of the presentation was the extended Bruce Banner scene. Despite (or possibly because of…) his relatively short screen time, Mark Ruffalo’s Avengers Assemble interpretation of The Hulk may well be my favourite version. Less introspection and more HULK SMASH! Then again I don’t know if this more singular version of The Hulk can be sustained for an entire film or if indeed I enjoyed this Hulk more only because we have had the opportunity to see the other Hulk’s. Either way Mark Ruffalo’s Bruce Banner is certainly more entertaining, sympathetic and plugged into the earlier comic zeitgeist than the other laboured tortured interpretations - which is good as Ruffalo is signed up for 6 more films. I enjoyed this clip as not only does Harry Dean Stanton feature in it, but the sudden lack of urgency and casual ambiguity in dialogue between Banner and Stanton’s Security Guard permeates the situation in Stanton’s trademark existentialism giving Avengers Assemble a little more depth something not really given time in the break neck pace of the rest of film and I can see why this scene didn’t make it into the final cut. It also explains one of the niggling questions that took me out of the film, the scene in question has stuck with me since seeing Avengers Assemble and along with the disappointment of Whedon not coming up, or attempting a pithy answer for one of Marvel’s greatest riddles, that of how The Hulk’s purple shorts always appear when needed and either shrink or expand to fit - immediately following on from that thought Bruce Banner arrives to join the Avengers in battle on a motorcycle. Where did this magic bike appear from? How on earth did Banner, who is seemingly on the run, with no money or pockets on his magic purple shorts come by all accounts a pretty nifty bike in perfect working order? Well the clip reveals all. I loved the effortless cool of Ruffalo and Stanton and the clip also gave me closure on something that stuck with me since my first screening of Avengers Assemble. In case you are not aware Item 47 is the third in the Marvel One Shot short series that are exclusively released on the Marvel Blu-ray releases. They explore Avengers Universe through the more mundane day to day activities of the S.H.I.E.L.D team (although nothing is mundane in the Avengers Universe) as well as serve as a bridge between films (not released yet) by threading new characters and situations into the Marvel Universe in a similar fashion to the post credit scenes. I think there is a strong case for the Marvel One-Shots series will eventually thread very neatly (and be a gateway) into the recently announced S.H.I.E.L.D. television series. I'm guessing the cast & crew involved in making the Marvel One Shot will be involved in the S.H.I.E.L.D. TV show. Incidentally the One Shots get their Marvel One Shot prefix title from comics that are also special one off editions, mainly a self contained story. Our first One-Shot that was released was Marvel One-Shot: The Consultant. In The Consultant which came on the Thor Blu-ray, S.H.I.E.L.D Agents; Phil Coulson ( Clark Greg ) and Jasper Sitwell ( Maximiliano Hernández ) are seen to discuss and hatch a scheme to try keep Emil Blonsky aka The Abomination ( Tim Roth ) from joining the Avengers Initiative during its inception. This requires the help of The Consultant. My assumption was that we haven’t heard the last of Blonsky and he will probably turn up in another Marvel film or the S.H.I.E.L.D. TV show. Marvel One-Shot: The Consultant threads events and characters from The Incredible Hulk, Iron Man 2 and ultimately Avengers Assemble. Then came the Marvel One-Shot: A Funny Thing Happened on the Way to Thor's Hammer that can be found on the Captain America: The First Avenger Blu-ray. This shows an event from Agent Coulson’s ( Clark Gregg ) timeline en route to investigate the mysterious Hammer in Albuquerque, New Mexico. We find out that Agent Phil Coulson isn’t just smart he can also handle himself physically if he needs to. A Funny Thing Happened on the Way to Thor's Hammer threads events and characters mainly Coulson himself from Iron Man2 with Thor and ultimately Avengers Assemble. Which bring us up to the Marvel One-Shot: Item 47. Item 47 picks up after directly after events seen in Avengers Assemble. S.H.I.E.L.D. recovered all but one... a Chitauri weapon, aka "ITEM 47." After a young couple, Benny ( Jesse Bradford ) and Claire ( Lizzy Caplan ), stumble into finding the elusive weapon, they embark on a bank robbing spree. With S.H.I.E.L.D. agents (LOST's Titus Welliver and AVENGERS's Maximiliano Hernandez ) hot on their trail, it's only a matter of time before the couple have to pay for their crimes. 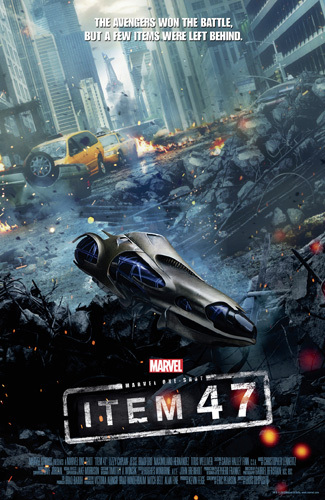 Marvel One-Shot: Item 47 takes place after events in Avengers Assemble and may lead us to Thor 2 currently shooting in the UK and as we are introduced to new S.H.I.E.L.D. crew - I suspect ultimately to the new S.H.I.E.L.D. TV series. I try wrangling answers out of Titus Welliver in our chat which will be up soon.